Whether you’re preparing for SAT, LCAT, GMAT, Mid-term or final exams, each simple exercise will help you get into the right state of mind prior to the exam and during the exam. 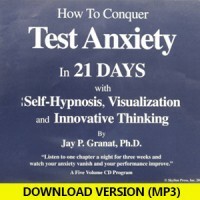 These simple techniques have been used to help thousands of people who suffer with test anxiety. Many of these methods have been used successfully by world class athletes who must be relaxed, confident and focused when the pressure is on. This 4 CD program is just $124.95 plus $10 Shipping and Handling. It comes with a MONEY BACK GUARANTEE.